The San Francisco Gay Men’s Chorus (SFGMC) has helped secure a four-story building that’ll soon serve as the National LGBTQ Center for the Arts, according to the San Francisco Chronicle. It’ll be the first-ever LGBTQ arts center in the United States and eventually provide free and highly discounted space for queer-related art groups, cultural activists, community leaders, educators and showcases that might not thrive otherwise. The Center will reside in a $9.6 million Art Deco building that was once the city’s former Baha’i Center for the Iranian faith. It’s located near the Duboce Triangle, just a 20-minute one-mile walk away from The Castro. To start, the space will provide a home to the SFGMC, a 40-year-old, world-touring group that has conducted its concerts and cultural activism for the last 40 years without a permanent home. Now they finally have one. In the coming years, the Center will eventually open up for other groups to use. Its facilities will allow groups to record and broadcast “everything from concerts and master classes to interviews and lectures, essentially opening up their programming to anybody, anywhere with an internet connection,” the Chronicle reports. Chris Verdugo, Executive Director of the National LGBTQ Center for the Arts, says, “The way we envision this space is really being a community space, so being able to bring in more LGBTQ arts organizations.” He says that includes groups from around the country and the world. The Center has been able to open in part thanks to a $5 million donation by SFGMC member Terrence Chan. Verdugo has said the National LGBTQ Center will seek women and people of color for its official board to help represent the scope and spectrum of the community it wishes to serve. 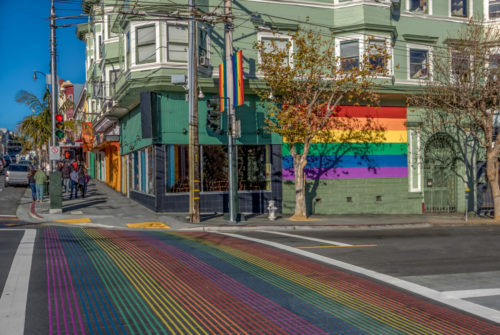 San Francisco is currently in the process of also developing a transgender historical district and queer leather district, continuing its legacy as cradle for LGBTQ culture, even as its skyrocketing rents continue to push the poorest, most marginalized queers and queer artists out of the city limits.